Avoid an expensive and time-intensive MES project which involves many responsible parties talking with each other, in the end, fails to include features that are significant to your business. 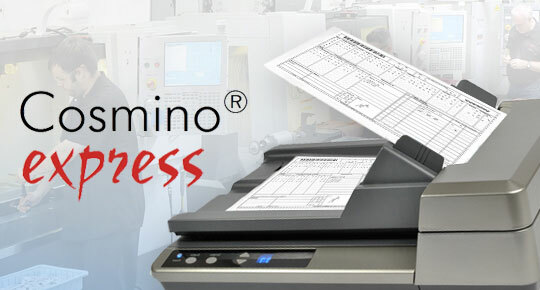 Cosmino Express is the inexpensive, faster software solution for the tasks indicated below. You can expand your system with additional features at any time, up to Cosmino MES, or use it as a sub-system for another MES solution. Data acquisition in manufacturing can become a challenge due to the often lack of uniformity in the machine landscape. In addition to automated transferal of machine signals (PLC, sensors and similar), Cosmino Express also makes manual entry of data possible using an online dialog. We provide data acquisition using machine-readable documents (see Cosmino IntelliScan) for use with minimal hardware and few IT resources in a manufacturing system that has not been networked. Ultimately, a network-capable PC, a document scanner and a printer will be required for operating the software for this. The data acquisition and entry methods can be combined and exchanged at any time. The system can be expanded to use optional interfaces for ERP, CAQ or MES systems for integrating into your IT environment. Cosmino Express OEE will report the operating data in this case and give you the additional functionality of an operational data acquisition system (PDA). The software for acquiring machine times and evaluating the effectiveness of the entire System. The Cosmino utility for the acquisition of quality data and quality assurance.